Black Friday Craftsy Sale – All Classes $19.99 or Less! Pardon me for blogging about Craftsy twice in one week, but holy-heck-of-a sale, Batman! All classes are $19.99 or less through Monday (sale ends Monday at 11:59 PM). 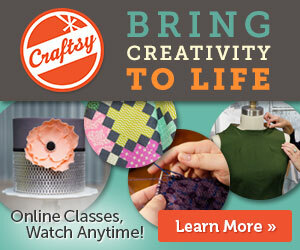 Click here to view all Craftsy Quilting Classes. If you’ve had your eye on any of the classes I’ve reviewed in the last few weeks, now is the time to enroll! I wanted to keep this short and sweet. You may now return to your regularly scheduled shopping bonanza. 🙂 Affiliate links provided by Craftsy. Hi Christa, I’m the one who made a challenge quilt from your logo picture. I tried to send the pictures to Christa Quilts.com but don’t know if you got them. I received a ribbon, too!